A New York county hit by a measles outbreak declared a state of emergency Tuesday and banned non-vaccinated minors from public places in a bid to prevent the once-eliminated disease from spreading, AFP reported. The measure, which defines a public place as anywhere "more than 10 persons are intended to congregate" -- including public transport -- was announced by officials in Rockland County, 25 miles (40 kilometers) north of New York City. Due to come into effect at midnight Wednesday for 30 days, it appears to be the most radical step by US officials following outbreaks in several regions blamed on an anti-vaccination movement. "We must do everything in our power to end this outbreak and protect the health of those who cannot be vaccinated for medical reasons and that of children too young to be vaccinated," said county executive Ed Day. Day also criticized the "resistance" of some locals to health inspectors. "They've been told 'we're not discussing this, do not come back,' when visiting the homes of infected individuals as part of their investigations," he said, branding such responses "unacceptable and irresponsible." Rockland County, with a population of over 300,000, has registered 153 cases of measles, which was declared officially eliminated in 2000. 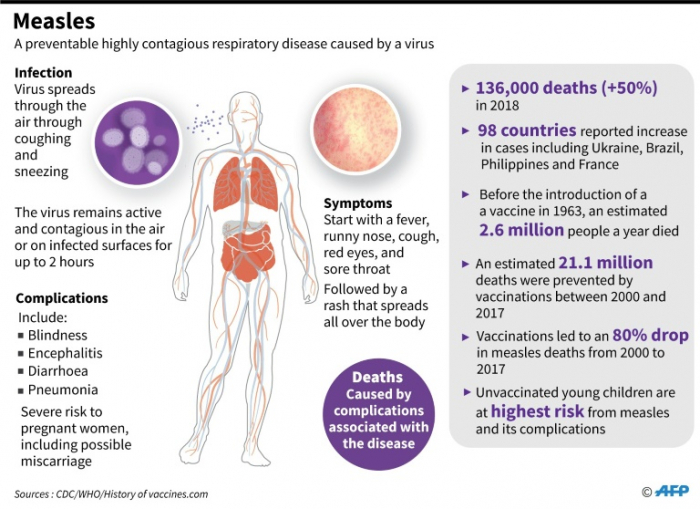 Despite major vaccination campaigns since the outbreak began in October, around 27 percent of minors aged one to 18 remain unvaccinated, Day said. Vaccinations are in theory required to go to school in the United States, but 47 of the 50 states -- including New York -- allow exemptions, notably for religious reasons.